The campus is painted again with the familiar black and white of Dramanon. Everywhere we go nowadays its dramanon posters and banners publicising their next production that we see. Here is a little sneak preview into their next production, God’s Favorite scheduled to play in Syndicate bank golden jubilee hall on the 3rd of April. 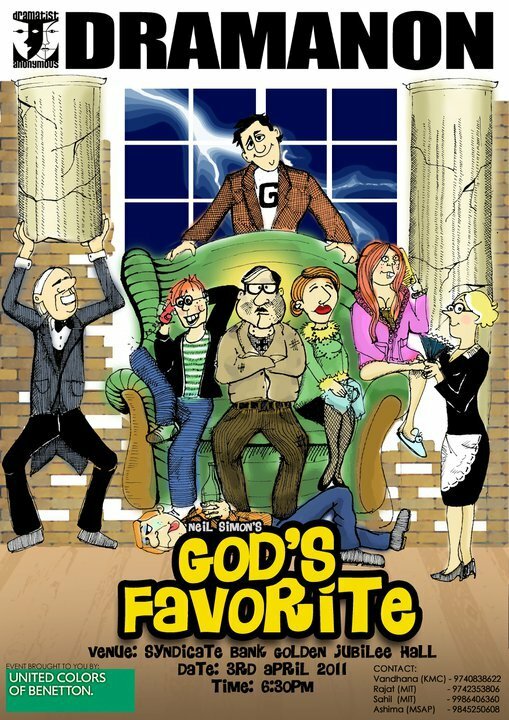 God’s Favorite is a Neil Simon classic. It was first produced as a broadway production by Emanuel Azenberg in 1974. A hillarious fun filled extravaganza. The synopsis goes as such. The setting of the play is a Long Island mansion, where dwells a pious, God-fearing tycoon named Joe Benjamin and his family: a long-suffering wife, Rose, a prodigal son, David, a pair of kooky twins, Ben and Sarah, and the maid and butler, Mady and Morris. One night a messenger from God, Sidney Lipton (with a big G on his sweatshirt) arrives and goes through all manner of temptations to get Joe Benjamin to renounce God. When he refuses, he is visited by all the afflictions imaginable. There are also a few new faces amongst the cast this time apart from the brilliantly talented duo of Sahil Dhawan and Abhinav Dhir. The night basically promises to be a laugh-a-thon, i am sure all theatre lovers will care not to miss and non lovers could afford to risk. The tickets for the show are available at dollops or at their KC infodesk which is up from 6:45 to 9 pm everyday. Dramatist Anonymous or Dramanon as it is more popularly known as amongst all students of Manipal is a theatre group that was started right here in Manipal, 11 years ago, with the aim of helping students and enthusiasts realise their acting potential. Over the years it has grown from being an theatre group confined to just manipal to a larger organisation with branches in major metropolitan cities such as Mumbai, Bangalore , Chennai and Hyderabad. Dramanon has produced some fine acting talent and a lot of theatre and commercial television actors have used dramanon as their initial platform. Each year dramanon manipal holds two production and auditions for the same. Check this coloumn for further updates and announcements regarding dramanon.